Descend into the core of the criminally insane as The Joker launches his most diabolical plot ever. The inmates of Arkham Asylum have been set free - and it’s up to Batman, to bring order to the chaos and take back the asylum. Explore the island in TRIOVIZ 3D and play 4 EXTRA CHALLENGE MAPS: Scarecrow Nightmare, Crime Alley, Totally Insane, and Nocturnal Hunter. PLAY AS THE JOKER Challenge Maps available only on the PlayStation 3 computer entertainment system. 04-06-2017 silverbow Box Text WELCOME TO THE MADHOUSE Descend into the core of the criminally insane as The Joker launches his most diabolical plot ever. The inmates of Arkham Asylum have been set free - and it’s up to Batman, to bring order to the chaos and take back the asylum. Explore the island in TRIOVIZ 3D and play 4 EXTRA CHALLENGE MAPS: Scarecrow Nightmare, Crime Alley, Totally Insane, and Nocturnal Hunter. PLAY AS THE JOKER Challenge Maps available only on the PlayStation 3 computer entertainment system. This is a list of VGCollect users who have Batman: Arkham Asylum - Game of the Year Edition - Greatest Hits in their Collection. This is a list of VGCollect users who have Batman: Arkham Asylum - Game of the Year Edition - Greatest Hits in their Sell List. 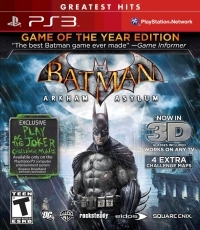 This is a list of VGCollect users who have Batman: Arkham Asylum - Game of the Year Edition - Greatest Hits in their Wish List.